It was a quiet weekend; not much happening and the weather wasn’t fantastic, with some rain about and the arrival of the first cool weather of the autumn. Should we go out and play radio or should we stay at home and do the ironing? Hmm. Decisions, decisions. Well of course radio, and a SOTA activation, won and the question then became which summit to visit. It had to be relatively close to home, easy to access and either we hadn’t activated it before, or if we had then the last visit had to be more than 12 months ago. I checked the log and saw she was right. 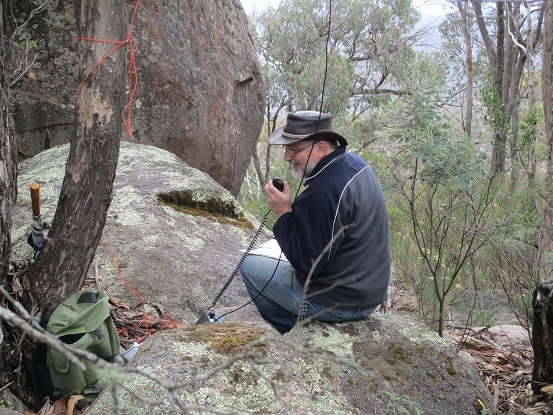 We last activated Mt Lawson in February 2013, in fact it was our first ever SOTA activation. 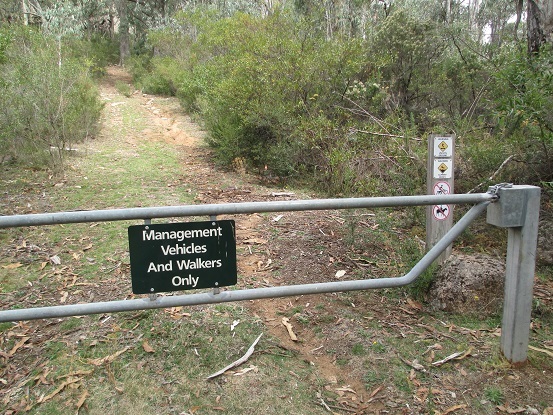 You can drive to within a couple of hundred metres of the summit and it’s a fairly easy stroll up to the top, at least it is in dry weather. There are plenty of trees on and around the summit so there’s no need to carry a pole to rig the antenna on. And it’s only an hour or so driving time from home. I remembered that last time we went up there we had to clear a fallen tree off the summit road, and I contemplated taking the chainsaw in case the same thing happened again. No, I thought, lightning doesn’t strike twice in the same place. We’ll be right. Anyway I always carry an axe and a bow saw in the 4WD toolkit so if the worst came to the worst we could use those. So my Lady packed us a picnic lunch and off we went, passing through a couple of light showers of rain on the way. We were delighted to find no trees or other obstacles on the summit road, and the only hold-up on the drive was the usual gaggle of Sunday drivers pootling along, rubbernecking at the scenery oblivious to other road users. Murray River Road is not conducive to safe overtaking, so we pootled along and rubbernecked at the scenery as well. If you can’t beat ’em you may as well join ’em, I guess. There were a couple of 4WDs parked in the summit car park when we arrived, and I checked them out carefully. No antennas were in evidence apart from UHF CB, so not likely to be SOTA operators, I thought. Then I looked back at my own 4WD, which has no antennas on it apart from a dual-band VHF/UHF whip that could easily be a UHF CB antenna. Hmm. When we met their occupants later at the summit it turned out that they were just tourists out for a Sunday stroll, so there was no competition for the best operating spot. 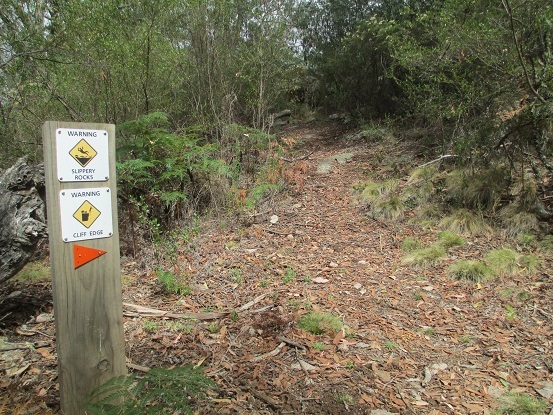 The walking trail from the car park to the summit is quite steep in places and the last bit climbs across smooth granite, which can be treacherously slippery when it’s wet. Although there had been a few showers of rain in the past 24 hours we found the rock dry and easy to traverse, and we got to the top without mishap. We wandered around for a bit looking for a sheltered spot out of the wind, which was chilly and blustery enough to make writing one-handed in the paper log something of a challenge. We settled on a location among the boulders on top of the hill, close beneath the commercial repeater installation. This was almost the same spot that we’d operated from on our previous visit. 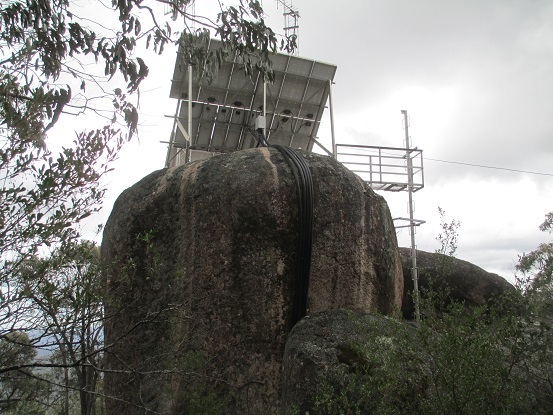 The repeater installation is solar powered and consists of the solar array and antenna installation, sitting on top of a very large boulder, and a green tin shed some distance away that houses the radio equipment. The system makes no detectable noise on the HF bands though I haven’t tried 50, 144 or 430MHz from that location so I can’t say what the QRM situation might be on those bands. The repeaters operate on 160 to 170MHz and 400 to 420MHz, close but not too close to the Amateur bands. There’s a microwave link on 15GHz as well but that’s not likely to bother any future SOTA microwavers who might venture up here. Away to the southwest there were some very threatening-looking black clouds that appeared to be heading rapidly our way. We watched them for a minute, mentally calculating the time needed to set up the antenna and complete the activation. Could we do it before the rain arrived? What the heck, we agreed, we’d come this far so we might as well go for it. If the rain arrived before we completed the activation, we could huddle under the big golfing umbrella that my Lady was carrying. We decided we’d make it a quick activation though, just 7MHz SSB and then we’d get out of there before the rain set in. With a little rock-hopping and some crashing about in the bushes we got the link dipole up, and I quickly put up an alert to announce my presence on 7.090 SSB. In 5 minutes I had very brief contacts with VK3CAT, VK3PF, VK3FPSR, VK3ARR and VK3AMB, enough for a valid activation. The first drops of rain landed on the back of my neck as I signed off with Bernard VK3AMB, so my Lady and I decided not to hang about on the summit. We quickly pulled the antenna down, packed everything away and rock-hopped back down to the trail, at which point the rain stopped. Sometimes you just can’t get it right, can you. By then we were hungry and our picnic lunch was waiting back in the ute, so we went on down.